A new starch-based film, or coating, developed by Agricultural Research Service (ARS) scientists, can make paper and other materials more water resistant and biodegradable. The film can potentially be used in food packaging, plastic bags, and other products, reducing the amount of synthetic products clogging landfills. Starch, which is 100-percent biodegradable, is used in some plastics and films because it is inexpensive and biodegrades rapidly. But existing starch-containing materials do not have the strength, flexibility, and ease of processing required for many other uses. Polyvinyl alcohol (PVOH), a petroleum-based synthetic polymer, is widely used for film applications, but it has limited biodegradability. Scientists at the ARS National Center for Agricultural Utilization Research (NCAUR) in Peoria, Illinois, recently developed starch complexes that can be blended with PVOH to improve the properties of films and make them more biodegradable. The team included chemist George Fanta, plant physiologist Frederick Felker, chemist Gordon Selling, and research associate William Hay. Says Fanta, "At our lab, we look for new value-added products from starch that benefit U.S agriculture and consumers. Products we develop can help replace totally synthetic products like plastic polyethylene bags and polystyrene foam packing materials." The scientists prepared the complexes from high-amylose corn starch and fatty amine salts, which can be derived from soybean oil. These complexes have unique and valuable properties not found in either ingredient separately. One recent aspect of this research was published in the Journal of Applied Polymer Science in 2016. "Our complexes can be blended with PVOH in large amounts to make films with good physical properties and increased elasticity," Fanta says. "They are also more resistant to water penetration than films prepared from pure PVOH." Some food packaging is also made from PVOH alone, Selling says. "We can incorporate up to 60 percent of these starch complexes in the packaging, and performance should remain unchanged." The complexes in solution can be applied to paper to increase its water resistance. 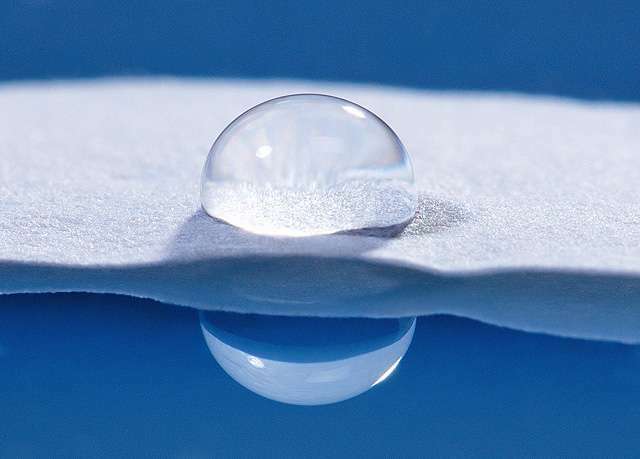 "A drop of water on untreated paper absorbs quickly," Selling says. "However, water on paper coated with these complexes beads up, remains on the surface for minutes, and often evaporates before soaking into the paper, depending on the formulation." ARS has filed a patent application covering the new paper-related technology, which is ideal for small papermaking companies and can be readily commercialized. "These complexes are 100-percent biobased and nontoxic, and the process is inexpensive," Fanta says.